Analog and RF/Wireless integrated circuit and module design professional with over 38 years of experience in the industry. Worked for Fortune 500 companies for 18 years (Intel, ITT, Plessey and GTE. Currently employed by Signal Processing Group Inc.
Directivity of Directional Couplers: another look. D = s31 + s21 – s32. where s31=coupling ratio, s21=insertion loss and s32 = isolation. All these are defined negatively in dB, but D itself is stated positively. A shorter form is also used for forward measurements as D = s31 – s32. The question is: why is directivity important? To elaborate a little: power is applied to port 1 and output at port 2. Some of the applied power is coupled to port 3 with a coupling factor of K^2. At port 3 part of the input power is sampled. Port 3 is the coupling port. Port 4 is the isolation port where ideally, no input power should appear. Any of the ports can be defined as the input port provided the other ports are appropriately labeled. Mathematically speaking we can define: Coupling = 10Log(P1/P3) = -20LogK ( dB). Also in a similar fashion the other parameters can be defined: Directivity = 10Log(P3/P4) = + 20Log[K/ABS(s14)]. Isolation = I = 10Log(P1/P4) = -20Log[ABS(s14)] dB. Insertion loss = L = 10Log(P1/P2) = -20Log[ABS(s12)] dB. The coupling shows how much of the input power is coupled to port 3. The directivity shows how well the coupler isolates forward and reverse signals. Isolation shows how much of power is delivered to the isolated port. The insertion loss provides the calculation for the amount of power delivered to the output port, less the power delivered to the coupled and isolated ports. 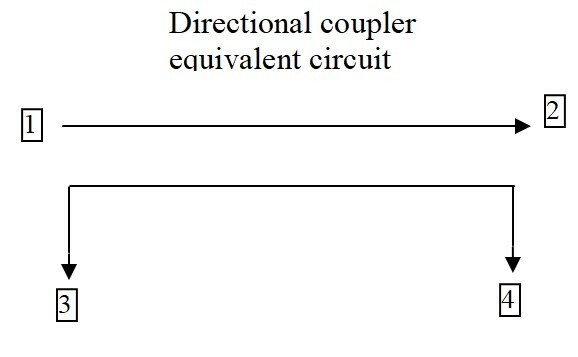 In an ideal coupler the directivity and isolation are infinitely high. Using the example of measuring an unknown impedance with a signal source, a detector and a coupler, we see that if the unknown impedance is perfectly matched to the source impedance then there is no reflection of power at all, and there is no reverse wave. So in this case we will measure the impedance perfectly. Its simple enough ! However, if the unknown impedance is not matched to the source impedance then there will be a reflected wave. We sample this using port 4. In this case however, the coupler not being ideal will transmit part of the reverse signal to port 3, the coupling port that we also use to sample the forward signal. Now there will be an error in the measurement. We need as little of the reverse signal in the coupling port as possible. A characteristic of the coupler. This is why directivity is important. The higher the directivity the less error we will get. A very good article on this topic is provided by REF1: ” Directivity and VSWR measurements”, by Doug Jorgesen and Christopher Marki of Marki Microwave Inc. They also provide curves of error versus directivity etc. A very readable article. Please visit our website for more articles of interest, calculators and a description of what we do and some of our products. The transformer primary and secondary inductance ratio is equal to the square of the turns ratio of the RF transformer. Simple, but useful identity for multiple applications and specifications. So Ls/Lp= N*N where N is the turns ratio of the transformer. Please visit our website for more information about us and other items of interest. 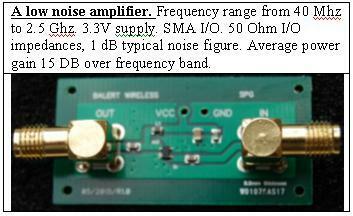 A class F amplifier is highly efficient and uses waveform shaping at the drain of a power device. This shaping takes the form of using ( usually) the second and third harmonic of the waveform to generate a drain to source ( collector to emitter) voltage that is roughly a square wave ( ideally a square wave, but we all know that ideal is a not a word we can use loosely). The drain current is then shaped to be very small when the D/S voltage is high and high when the D/S voltage is low. This causes a non-overlapping condition in operation and ensures a high efficiency. A pre-distortion or pre-conditioning circuit is also required to get the desired linearity. ( This is the subject of a later post). The waveforms below are what we got using Microwave Office as the simulator. The active device was a Cree 40010. It is simply instructive to examine the waveforms in case the reader is starting to design a Class F. The figure below represents the drain source waveform. The figure above is the D.S current in mA. 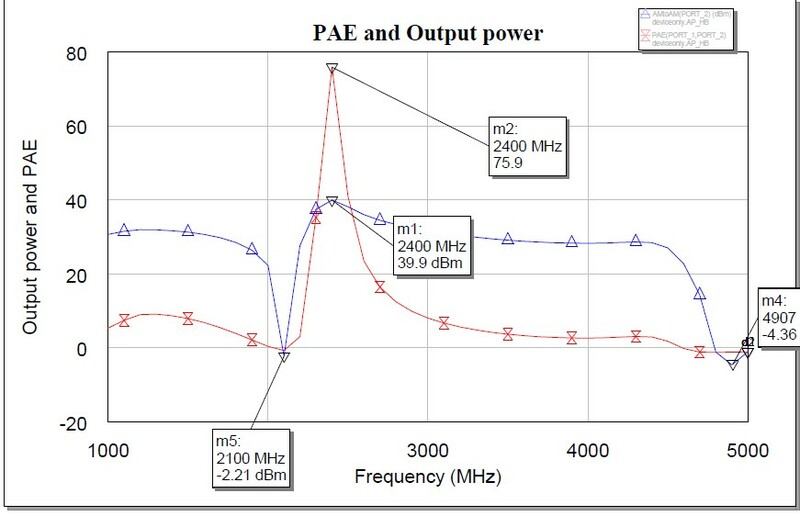 The figure below is the simulated power gain and PAE. We hope these will be of help to aspiring designers of Class F amplifiers. Please visit the Signal Processing Group Inc., website for more information and articles of interest. In double stub matching the two stubs are spaced a predetermined distance away from each other. These distances are typically λ/8, λ/4, 3λ/8, 5λ/8 etc. Knowing what we know about a length of line acting as a transformer, we know that the length of line between the two stubs acts as a transformer. The action of this transformer is to convert the admittance at the position of stub 2 to a different admittance at the position of stub 1. So we start from the position of stub 2. In order that stub 2 can be finally used to match the line admittance, the real part of the admittance at the position of stub 2, on the line, has to be 1.0 (normalized value). Its susceptance is then jB. jB is the susceptance that is cancelled using stub 2 to ultimately get the matching to the line admittance. The admittance at the position of stub 2, (without the stub) lies on the constant conductance, g = 1 circle. The admittances on the g = 1 circle are all the possible admittances at the stub 2 position for a match to take place. To reiterate, as a result of these deliberations, that some point of the VSWR circle formed by the position of stub 2, must intersect the g=1 or the unity conductance circle on the Smith Chart. a circle of equal radius but having its center rotated (moved to or displaced) by the spacing between the stubs towards the load. Lets call this spacing ‘d’. This circle is called the spacing circle. Please visit our website for more articles of interest. Its interesting how really old digital or mixed signal testers can be used in new ways with a good loadboard. I do not know how many engineers remember the old IMS tester. Its really old but with proper care and maintenance still provides good service. Its basically a digital tester but there are options that allow it to operate as a mixed signal or analog tester. Even a digital only tester can be used as a high frequency analog/RF tester with the proper load board. The high frequency – digital interface resides on the loadboard. The tester then is used in its standard capacity as a digital tester. The interface takes care of the RFMW/Analog interface. Interesting. Please visit our website for more articles of interest, products and services offered. SAW filters can be a great way to get precise filtering done at reasonable cost ( $1.0 – $2.00 for 915 Mhz, 26 Mhz B.W. filter). However, they do need to be handled with respect as they are ESD sensitive devices. A good app note can be found at http://www.mouser.com/pdfdocs/ESDProtectionforSAWFilters.pdf for interested parties. Check out our website for more info and our services. Comparison of the characterisitic impedance of PCB lines using the SPG calculator, TXLINE and APPCAD calculators. A comparison was done for results obtained using the Signal Processing Group Inc., characterisitic impedance calculator, the NI TXLINE calculator and the APPCAD calculator. 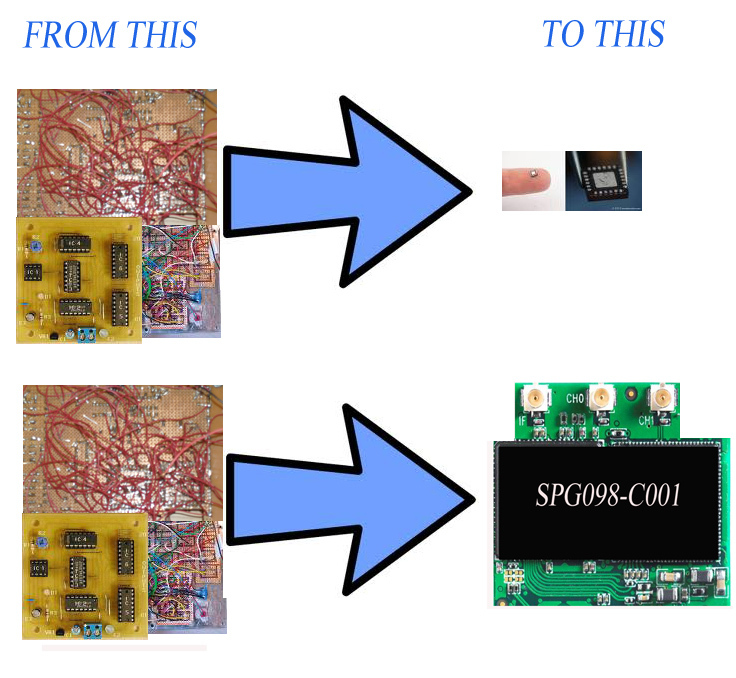 The results are: SPG calculator -> 71.4 Ohms, TXLINE->79.47 Ohms and APPCAD -> 68.96. Please visit our website for more information about us and more technical articles. RFMW design: Comparing the leading CAD tools, ADS ( Keysight) and Microwave office ( NI) for RFPA design. ( 1 ) Technical support on MWO was excellent. Questions were answered and much more. ADS technical support was sluggish and difficult to get to. (2) Model installation in ADS was extremely easy while that in MWO was a little messy and took a long time. (3) License file installation was very easy in ADS and fairly involved and difficult in MWO. (4) LineCalc on ADS was very good and provided accurate results. TXLINE in MWO was less so and needs some improvement. (5) Running two tone simulations was very easy on ADS and quite difficult on MWO. However MWO provided a more flexible interface and experienced MWO users will probably like it more. ADS has a somewhat more limited tool. (6) Help on ADS was marginally better than MWO, and provided more explicit answers than in MWO. (7) Up and running time was short on ADS and long on MWO. (8) Examples on ADS were marginally better than in MWO and provided more details and help. (9) MWO marketing/sales support was simply superb and very obliging. ADS sales support was very slow and in some cases non-existent. (10) MWO has a much better stable of CAD tool routines than ADS. This allows a more flexible approach to analysis. (11) ADS has a better user interface for output results that includes both textual and graphic output accesses with ease. (12) Not enough evaluation time was provide to go into EM and layout eval so these are not addressed in this post. To conclude: For someone getting into RFMW analysis tools ADS may be a better choice initially but much less flexible and somewhat limited CAD tools. MWO is for the more experienced user, but its limitations are compensated by the level of and quality of the technical and sales/business support. Please use our website at www.signalpro.biz for contact or for comments or for more information about our services. 1.0 A single stub match involves the use of a stub of fixed length placed at a fixed position on the transmission line from the load for a specific load. 2.0 If the value of the load changes then the length of the stub and the position at which it is placed must also change. 3.0 A better technique would be where we could fix the positions of the stubs in relation to each other and only change the lengths of the stubs to match varying loads. This is done using the techniques of double and triple stub matching. 4.0 Both analytic and graphical techniques are available to do double stub matching. The graphical method is usually the Smith Chart method and that is what we have focused on. However analytical techniques can be enlightening as well, and are recommended if you are mathematically minded. 5.0 In order to further understand the technique of double stub matching you need a reasonable amount of the understanding of how the Smith Chart works. 6.0 There are some loads that cannot be matched using double stub matching by simply altering the length of the stubs. However if we are willing and able, to move the stubs together a distance away (or towards the load) from the load then we can accommodate the load. This can be discussed and illustrated using the Smith Chart method. These loads form an area of the Smith Chart collectively known as the forbidden zone for double stub matching. 7.0 Additional techniques can be used to overcome the limitations of double stub matching if needed. Similar techniques to that of double stub matching are used for triple stub matching. The interesting situation as far as learning about double stub matching is that there are very few articles available that really discuss the technique for the newbie. We know as we did a web search and came up with very few articles that deal with this. A forthcoming book from Ain Rehman of Signal Processing Group Inc, addresses these techniques in some detail with a minimum of math. 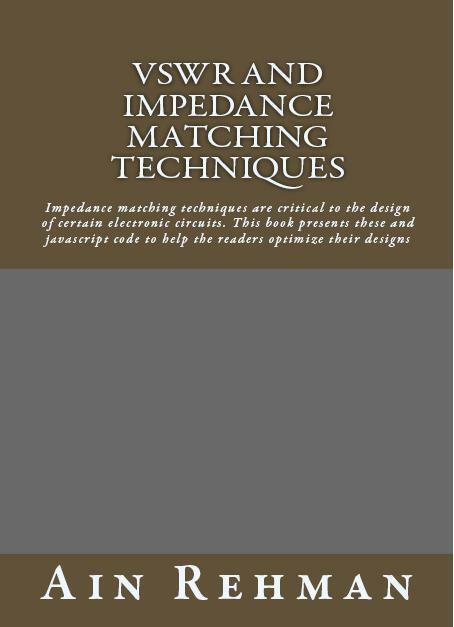 The title is VSWR and Impedance matching techniques. This book will be available on Amazon both as a paperback and as a Kindle book shortly for interested readers. Please visit our website www.signalpro.biz for more information and other articles of interest. 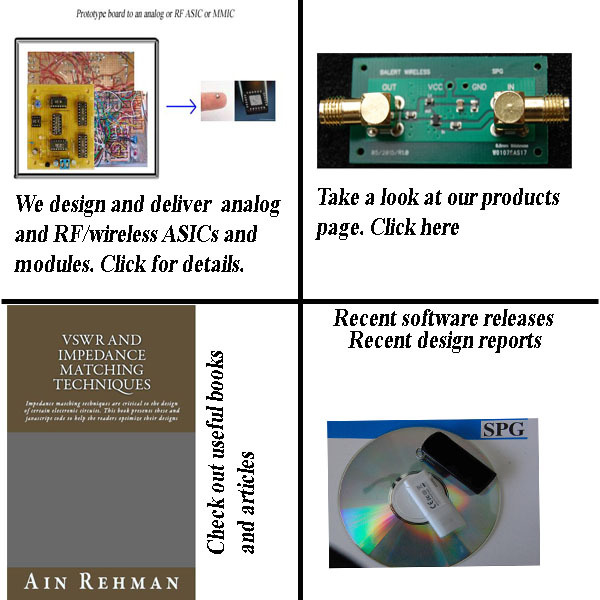 A low noise RF amplifier by Signal Processing Group Inc.
Its so impressive to see the amount of freeware now available to do RFMW design and development. From the “free-est” of freeware for RFMW ( APPAD) to many other packages. A harmonic balance tool is also available as freeware. The consequence is that we as design engineers do not always have to pay an arm and a leg to get the commercial packages ( of which there are few) and be hostages to these vendors. A lot of work can be done prior to spending umpteen dollars so that the cost can be lowered significantly. Currently we have a few of these freeware tools under assessment and will be reporting on their performance in this blog.